What is it that spurs you on to wake up early and workout? Is it because you want to look good to impress a certain someone? Or is it simply because you have a few pounds to lose in certain areas, and a few pounds to gain in others? I mean, who doesn’t? Whatever the reason you’ve chosen to get fit, we applaud you. It’s a noble goal and it doesn’t matter where you are on your journey to better health. You’re miles ahead of anybody who isn’t trying. And to celebrate your desire to get healthier, let us help you. We wanted to walk you through how to buy the best dumbbells for home use. We’re going to dispel some myths about the best dumbbells for the home gym, and we’ll take you through some of the different sets that you can buy, like the best adjustable dumbbells. But to be honest, this is a hard article to write. 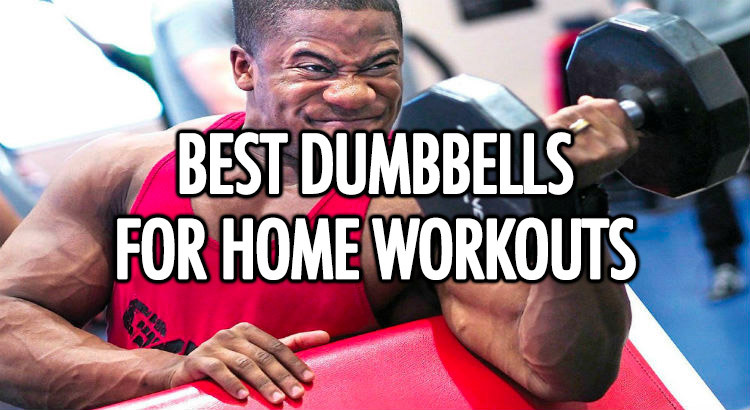 Because the best home dumbbell set is the one that you’ll actually use. And that part is up to you. When you get into the thick of it, you’ll discover that there’s a whole range of dumbbells that you never even knew about. You need to discover, first, what is available to you and then we can talk about the dumbbells set that you need. They break down into two separate categories; fixed and adjustable dumbbell sets. Fixed weight dumbbells are weights that are, well, fixed. If you want to lift a 5kg dumbbell, you must pick up the 5kg dumbbell set. And then for a 7kg set, you have to find the 7kg dumbbell. The advantage is that you can use weights that are suited to your needs. If you’re working on your rehabilitation, then you can use a lighter set of weights. You don’t have to constantly adjust weights, putting on and taking off weight plates each time you move on to a new exercise. Have the weights ready when you are. Adjustable dumbbells are exactly what you think they are; adjustable. They are a compact way to get a complete workout without needing to buy (and store) a complete set of weights. 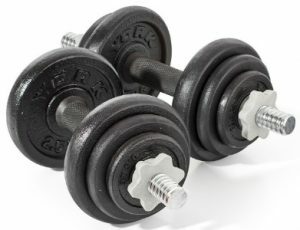 Standard: These weights usually are like the dumbbell sets you imagine when you think about lifting hand weights. They come with a set of plates that you can add to, or take off the bar. They lock into place and allow you to add as much weight as you need to achieve your exercise goals. Selectorised: These weights are slightly different to the standard design, although the concept is the same. You still use the weights, adding to or taking off the amount you need. The difference is that you use just the one bar, and “click in” to remove or add weights. These just might be the weights you’re looking for in a home gym. As you dial up or down the weights, the bar engages with the right amount of plates. Then, when you lift it, only the weight plates you clicked or dialled in remain on the bar. As for convenience and storage, these weights are super easy. You don’t need an entire gym space to keep them, and you can adjust the weights in a matter of seconds. Do your exercises, click back into the stand, turn the dial to add/remove weights, and then move on to your next exercise. Don’t let excuses hold you back anymore as we unveil our top choices of dumbbells for your home use. We now bring you our top pick for the best dumbbells for 2019. Looking for a set of rubber dumbbells? Tired of marking up your floor? The BodyMax dumbbells are a fixed set of weights that should solve that issue for you. The rubber coating on the weights gives you a safe way to do your exercises without risk of damage to your floors or to your body. You choose the hexagonal weight set you need and do your workout as you normally would. We love the shape of the weight because it won’t roll away when you put it down. It securely sits exactly where you need it. 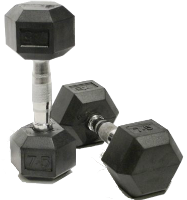 Buy these weights in whatever sizes you need, choosing as little or as many different sizes as you need. These are available on Amazon here. We’ve talked about it before, but the PROIRON dumbbells are one of the best choices. It’s a cheap dumbbell set that doesn’t let you down. You can simply add the amount of weight you need to the bar and screw on the lock to secure it. It’s a compact and no-frills way to do your workout, endlessly allowing you to change up your routines. The cast iron dumbbells give you the ability to perform any range of dumbbell exercises, but it also comes with an extended barbell. You can now add weight to the barbell to do deadlifts, squats and lunges in addition to your normal routine. You can even do bench presses now, building up chest and shoulder strength. Add weights up to 20kg using this adjustable dumbbell set. Check out the latest price here. 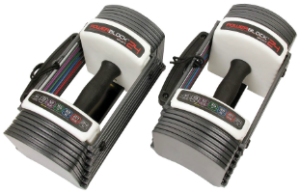 As an alternative, we’ve chosen the York Spinlock dumbbells as well. This is a no-nonsense weight set that doesn’t come with fancy accessories or unnecessary additions. If your home gym requires just the basic set of dumbbells, you can buy the York set and never need anything else. You can add up to 20kg on the bar, which is about as much as you can find at any normal gym. The spinlock collars keep the weight securely fastened to the bar while you work out. The knurling on the bar also gives you an excellent grip on the weight, keeping you safe from accidentally dropping it on your toes. Are these the best adjustable dumbbells we could find? Maybe. Is that a big call? Sure, but it’s also true. We were so impressed by this set of adjustable selectorised dumbbells. It’s crafted to look unique, and give you a full workout no matter your level. 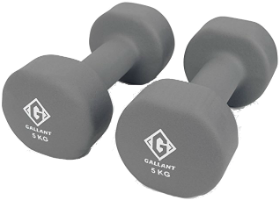 The weight sets starts at 1.5kg per hand and goes all the way up to 11kg per dumbbell. You can adjust 8 different weight sets, effectively reducing the space you need in your home gym. 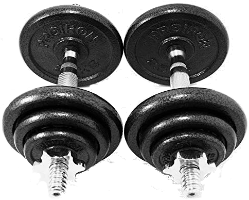 Replace up to 8 sets of fixed weights using just this one adjustable dumbbells configuration. That’s a pretty good savings right there. We were also super impressed that this set comes with a 15-year warranty. Will you use these for 15 years? That’s up to you. But if you do, they’ll still be working as new. Check out the price of these here. When you look at this set you know it’s for serious lifters who want extreme performance, it even has style to match. This system is a selectorised set and it works as an adjustable set that you dial up or down. 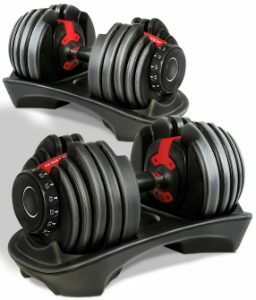 Is it the best adjustable dumbbells set? We might be tempted to say that it is. Click the knob around to engage the weight plates. Then simply workout with one of the 15 different options. Yes, the price point is higher than most, but the space savings and the savings on the cost of 15 individual dumbbells would be far greater. We love the base to secure it when not in use. We also love the plastic coating on the weights, reducing the chance of injury and harm if you dropped them. The innovative click system makes us want to simply play around with the weights rather than actually working out. But hopefully, you’ll be inspired to up your game in the gym. 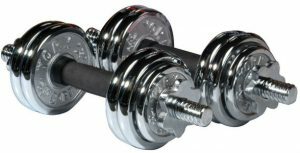 Check out the price of these amazing dumbbells on Amazon here. If you’re searching for a little “bling” in your home gym, maybe you’d be interested in the York chrome dumbbells. They’re flashy and fancy, creating a unique appeal that adds to the atmosphere of your home gym. These sets of dumbbells come in a nice carrying case, giving you an immediate storage solution if you need it. The 15kg dumbbells are adjustable and lock in nicely once you spin the lock in place. Rubber grips and a nice workout chart complete the package for these flashy, fancy weights. Check out the current price on Amazon. Maybe you’re looking for something that’s not as ostentatious as a large workout set of dumbbells. Or maybe you simply need something that can transition as a yoga or running weight. The neoprene coating gives it a unique advantage to those long runs. It won’t slip out and won’t retain smells like other coatings might. The neoprene comes in 0.5kg all the way up to 5kg individual, colour-coded sets. You won’t lose track of the pair like other cast iron dumbbell sets. These are perfect for lighter exercise for women or for anybody looking for lighter rehab weight sets. Dumbbells are one of the easiest ways to get in a full workout at home, without the need for costly machines or expensive equipment. You can add weights to just about any exercise you do, across every major muscle group. We love dumbbells so much that we added them to our ‘Best Home Gym‘ list of equipment. They made the list simply because they are so easy to store and so convenient for your home workout routine. Not only are they convenient, but using dumbbells at home can make a noticeable difference to your shape and workout routine, but don’t just take our word for it. You can increase or decrease the resistance to any workout or any routine you’re already using, just by adding weight. Are you already into yoga or a program like P90X? The best adjustable dumbbells can supplement your workout. Training your legs on lunges and squats? Add dumbbells to build a better booty. Trying to exercise your core? Get faster results using dumbbells. Looking for big, broad shoulders and bulging biceps? Absolutely use dumbbells to craft your perfect physique. Just make sure you keep your form good and don’t swing your arms too much. Dumbbells are also perfect for building the chest; here are some of the best dumbbell chest exercises. Let’s take a look at some of the different types of hand weights you can buy. Like no other home gym equipment, dumbbells add to every exercise. They don’t hinder your movements so they work in any range of motion you’re looking to perform. You aren’t restricted to the machine size, the barbell length, or even the location of your workouts anymore. Dumbbells just remove any and all excuses from your life to get in there and just work out.